After a successful Kickstart, the new Gnarbox 256GB SSD rugged backup device is now available for pre-order. The price is $499, but keep in mind that a 256GB XQD memory card now costs $463.50. 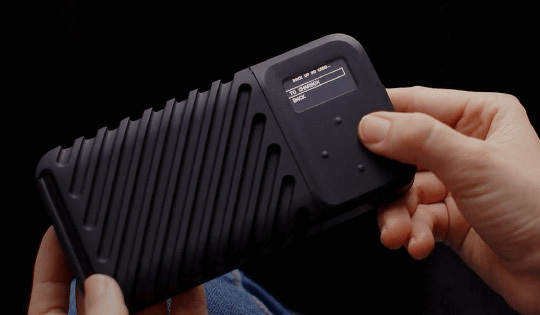 Built to encompass a vast array of mobile applications that serve the professional workflow, the GNARBOX 2.0 SSD Rugged Backup Device is available with capacities of 256GB, 512GB, and 1TB of NVMe PCIe storage. Version 2.0 features several improvements and upgrades over the previous model, making it more suited to work with advanced types of media, including raw images, plus H.264, H.265, ProRes, and MXF files. When working with iOS devices, the GNARBOX 2.0 integrates with mobile applications, such as Adobe Lightroom CC and LumaFusion. Users will also be able to perform one-touch backups with their laptop, phone, or tablet using the integrated OLED screen and buttons, as well as rate and apply metadata to media and organize photos before migrating them into desktop photo editors. The GNARBOX 2.0 has been upgraded with a 2.4 GHz Intel® Quad-Core™ processor, integrated Intel HD Quad-Core graphics, two USB 3.0 Type-C ports that transfer data at up to 400 MB/s, an SD card reader that transfers data at up to 75 MB/s, and a micro-HDMI port for displaying your content on an external monitor. Wireless connectivity is achieved using Wi-Fi 5 (802.11ac) at speeds of up to 867 Mb/s and the removable 3200mAh battery lasts for three to five hours of continuous use and can be recharged in around an hour. Thanks to IP67 certification, the GNARBOX 2.0 can endure being submerged in 3.3' of water for up to 30 minutes. This entry was posted in Nikon Mirrorless Camera, Nikon Z6, Nikon Z7 and tagged Gnarbox 256GB SSD rugged backup device, Nikon Z6 Z7 with one XQD memory card. Bookmark the permalink. Trackbacks are closed, but you can post a comment.